Some say there's not a lot to do in Vang Vieng - it's just being there that works its magic. But that's playing down the pleasures to be had in this laidback, spreadout town. First the serious stuff: there are some interesting wats to visit, some beautiful walks along the river at the right time of the year, the caves (see left), and the visits to villages a short way outside the town. Then there is the fun to be had on the river itself. You can buy a long trip, just you and your inner tube (and all your friends and their inner tubes, of course), floating down the Nam Song ... doesn't sound wonderful but it is a wonderfully serene experience enlivened on the way by friendly people hailing you for everything from souvenirs to food and Beerlao. Or, you could do something similar using a kayak. Whichever way, take care and make sure you have a lifejacket on. There is a market to look round ... and scores of places to eat, drink and (groan) watch television. Or you can just laze about. Accommodation is very cheap, unless you want one of the more upmarket places, and your cash goes a long way with everyday living. People who have been in the past remark about how it has grown ... you'll be saying the same in a few years. So enjoy it now! From Vang Vieng, looking over the quiet waters of the Nam Song to the limestone outcrops layering into the distance in hazy greys and blues, is one of the most beautiful views imaginable. 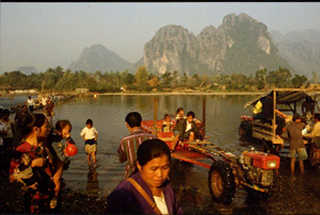 In the foreground, as you stand there, are people from outlying villages arriving and departing in motorised ox carts that trundle through the wide, shallow river. Others use the half-bridge, which starts in the shallowest parts and creaks across the deeper stretch near the bank. The people are there to work, to trade, to shop, to take care of medical and administrative needs in this small town of quiet streets and friendly people. There is a small market in the centre of the town, a few eating places  serving backpacker-sized meals and tea in chipped pint mugs  and a wat that is notable in looking rundown and keeping its valuables chained behind a door. But the real attractions of the area are the scenery ... and the numerous caves and caverns. Perhaps the most interesting is the Tham Phu Kham cave, half an hour's spine-compacting ride away from Vang Vieng in the only mechanised transport: the carts drawn by Chinese mini-tractors. Near the foot of the cliff-face, 600ft below the cave's entrance, the path begins in a deceptively gentle manner  over a clear river on a bridge made of twisted logs, through an area of grass, and then an easy climb. But soon it gets steep, then steeper, and finally almost vertical with boulders and makeshift footholds being the only help. A last heave gets you into the mouth of the cave. It is pitch black: the kind of place that you can see only when you look at your flash-lit photos later. Then, low on the left, you can make out ... a golden reclining Buddha in a haze of half-light from another hole in the rock face a hundred feet higher and further along. Climbing down through the cave, even with the help of a small torch, takes another 10 minutes but, eventually, you get to the enormous cavern and the Buddha. It is maybe 15ft long, with a golden canopy, and all around is fresh evidence of visitors: candles burned down, flowers, incense. Further on, deeper into the cavern, galleries lead off, but for the skilled locals only. The great cavern was used by local people 200 years ago as a refuge from Chinese invaders. Now it is an attraction for anyone passing through.